Juan Ramirez, Esq. - Escamilla Law Group, PLLC.Juan Ramirez, Esq. - Escamilla Law Group, PLLC. Juan Ramirez’s passion is to provide legal advice to clients in personal injury matters. Mr. Ramirez graduated from Phoenix School of Law and was admitted into the State Bar of Arizona after graduation. Before practicing law, Mr. Ramirez enjoyed a career as an electrical engineer. Mr. Ramirez is a graduate of Arizona State University. He earned a B.S. in electrical engineering. Following graduation, Mr. Ramirez worked at the Yuma Proving Grounds for a Department of Defense contractor as an engineer project manager. There, he tested military vehicles during the Iraq conflict. Subsequently, Mr. Ramirez returned to Phoenix, AZ to work as a communications engineer for Arizona Public Service. While in law school, Mr. Ramirez was an active member of the Hispanic Law Student Association and the Federalist Society. Mr. Ramirez also served in several student leadership roles, including president of the St. Thomas More Society and secretary of the Asian Pacific American Law Students Association. Mr. Ramirez has a passion for serving his community and is involved in service-oriented organizations. 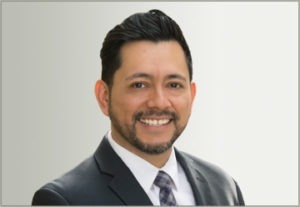 Currently, Mr. Ramirez serves on the boards of St. Thomas More Society of Phoenix, Valley of the Sun Kiwanis, Catholic Phoenix, and he is a graduate of the Tepeyac Leadership Initiative. Mr. Ramirez is also an active member with Los Abogados Hispanic Bar Association and the Arizona Trial Lawyers Association. Home » Juan Ramirez, Esq. Copyright©2019, Escamilla Law Group, PLLC. All Rights Reserved.